"Falling leaves, tranquil winter days and Holiday Cheer herald a season of full-bodied ales. 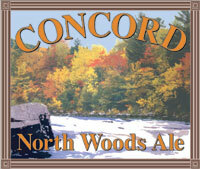 North Woods Ale is a rich brew colored by earthy hues and punctuated by bold tones. It bursts with the vibrancy of the North Woods itself. Enjoy this limited release seasonal ale while enjoying the dazzling colors of fall, or the brilliance of a crisp white winter. The North Woods Ale pours a dark amber/light brown color with a fizzy off-white head. Aroma is of light hops with a hint of perfume and fruit. Sean likes the sweet smell, and says it entices him to drink more. Initial taste is lightly sweet, which carries into the finish. Light body with a creamy mouthfeel. Light alcohol presence.